Serving as an ongoing showcase for some of the best and heaviest bands emerging from the underground, each chapter will shine a light on those worthy of your attention. Consisting of 3 versions of 12” wax with full colour sleeves and inserts, the series is designed to be saved and treasured, like a fine anthology of books. So much so, when the albums are filed next to each other, the complete collection of aligned spines will form a “blow-your-mind image” direct from the rock underground. Following on from the series’ first instalment released last summer, an album split between NY doom bluesers Geezer and DC stoners Borracho, …Chapter 2 features brand new music from riff-drivers Supervoid and veteran rockers Red Desert. 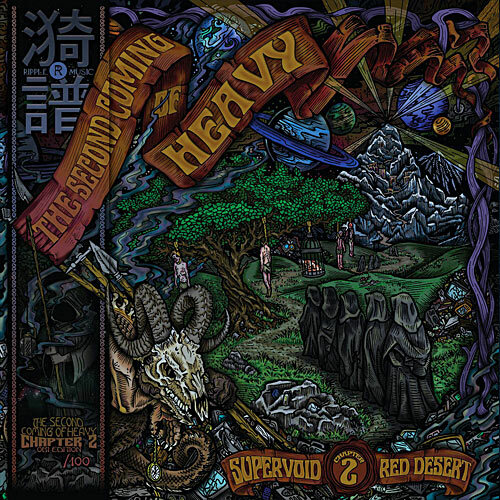 The Second Coming Of Heavy; Chapter 2 will get an official vinyl release on 27th February 2016, limited to 300 copies. Available now on iTunes and all digital platforms. Bandcamp to go live Feb 27th.